Very mild spoilers ahead. I won't tell you what actually happens, just an important point about the timing of the battle. Proceed with caution. I wanted to do this blurb because, after finishing the book, I remember feeling a little misled. 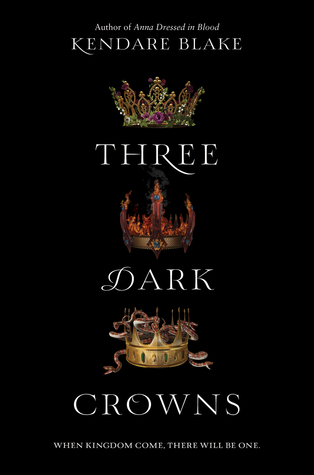 I think part of the reason it took me so long to get into Three Dark Crowns (which I did end up really enjoying, to be clear) is that I was expecting one story from the blurb, and I was given quite another. You're expecting a huge battle between three queens, right? So was I. In fact, the first book only goes up to the very beginning of the battle. The night they turn sixteen isn't the start at all. It's where the book starts, but there's still a good month or so until the ceremony that marks the beginning of the queen-for-all. Most of the book deals with each queen struggling to prepare for the battle. There's intrigue, friendship, betrayal, and a lot of plotting, but it took me long enough to wonder why it was taking so long to get to the fighting that I didn't really settle in til halfway along. Misleading! That said, the blurb itself is decent, although that second paragraph is a snooze. I also wish, of course, that it focused more on the cool stuff that actually does happen instead of foreshadowing something that's really more of a book 2 event. I think the blurb is very misleading. It promises battle and death, and then the book practically goes nowhere. It starts out very exciting, but then it was a mess. I really wanted to like this one, but I couldn't. Yes! Right? I ended up liking it well enough, but I almost gave up on it a few times because I was wondering why we never got to the battle at all. 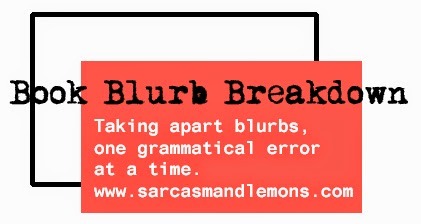 Okay so fun fact: I never read blurbs. Well, I read them only when I am adding the book to Goodreads, and quite literally not again until AFTER I read the book. Second fun "fact": This was freaking HILARIOUS and I loved it. I do think that the blurb is... Idk if it is misleading, but it isn't wholly accurate either, I guess. (Although the Arsinoe thing? MIND. BLOWN.) Though actually, the Mirabella thing IS kind of misleading. The rest of it is like... it's almost a SERIES blurb and not a THIS actual book blurb, maybe? I have no specific recommendations, but I want you to do these as much as possible, basically. I LOVE THIS. That was smart. I usually don't read them right before I start, but I did with this one and that was a mistake. Hehe I'm glad you enjoyed it! YES it reads exactly like a series blurb. They really need to change it. Too late, I guess. YAY I love doing them! I'm glad you enjoy it! They're my fav post type.